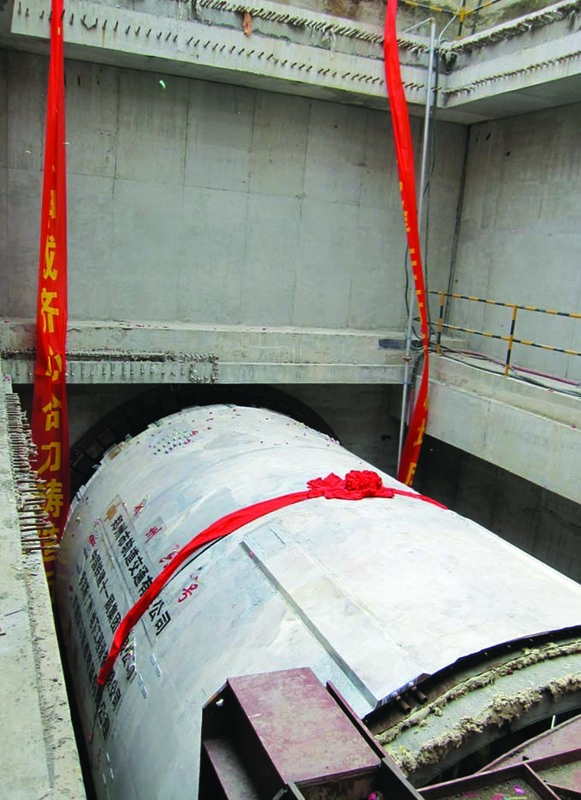 Late October will see the 11th Bureau of the China Railway Construction Corp (CRCC) launch the second of its two 6.3m diameter Robbins EPBMs deployed on the 3.6km long twin-tube tunnels on Zhengzhou Metro’s new Line 1. The first machine was launched from the 16m deep shaft on September 28th 2010. The tunnel alignments run under downtown Zhengzhou with cover as low as 8m and will pass through four intermediate stations between the Kaixuan and Tongbo areas of the city. Ground is expected to consist of clay, fine sand, loess, and some pebbles, with little groundwater. “The most critical issue for this project is passing under Xi Liu Lake, a large body of water with a depth of 1 – 2m. The distance between the bottom of this lake and the top of the tunnel is just 7m,” said Steven Zhu, Robbins Project Manager. The tunnel will also pass beneath building foundations and a highway interchange bridge. In order to reduce settlement, foam and bentonite will be injected for soil conditioning. The advance rate and the material removed will be continuously and closely monitored to prevent subsidence. As the machines bore, they will line the tunnel with 300mm thick concrete segments in a 5+1 arrangement. Curves with radii as small as 200m will be negotiated using active articulation to prevent segment deformation. Line 1 of Zhengzhou Metro will consist of 26km of tunnel and 22 stations once complete in 2013. The Zhengzhou Metro company has invested US$1.5bn in the six rail lines, which will total 188km by their completion between 2015 and 2030.